Herb container gardens are popular for many reasons. Even if you have miles of property and gardens galore, it's so convenient to be able to step out your door and pick a handful of fresh herbs from a beautiful container garden, any time of the day or night. Maintenance is also more convenient with containers, and there are fewer problems with weeds and critters getting into your crop. You can grow almost any herb in a container, and most are very easy. However, herbs can have different water requirements, and some are more finicky than others, so be sure to put herbs with similar needs in the same pot. You can grow as many types of herbs in one container as you want, as long as you make sure that all the herbs in a single pot share the same sun, water, and soil preferences. For example, rosemary likes it hot and dry, while parsley needs steady moisture. Therefore, they don't work well together in the same pot. Don’t forget that herbs can also serve as decorative elements in any container garden, adding texture and scent when mixed with annuals or perennials. Again, just be sure to pair them with plants that have the same requirements for light and water. You can use almost anything for an herb container as long as it provides for good drainage. Most herbs don’t have large root systems, so you can get away with smaller containers. This is especially true of the herbs that don’t mind drying out between waterings. However, the smaller the container, the less soil there is, which means you have a smaller margin of error when it comes to watering. 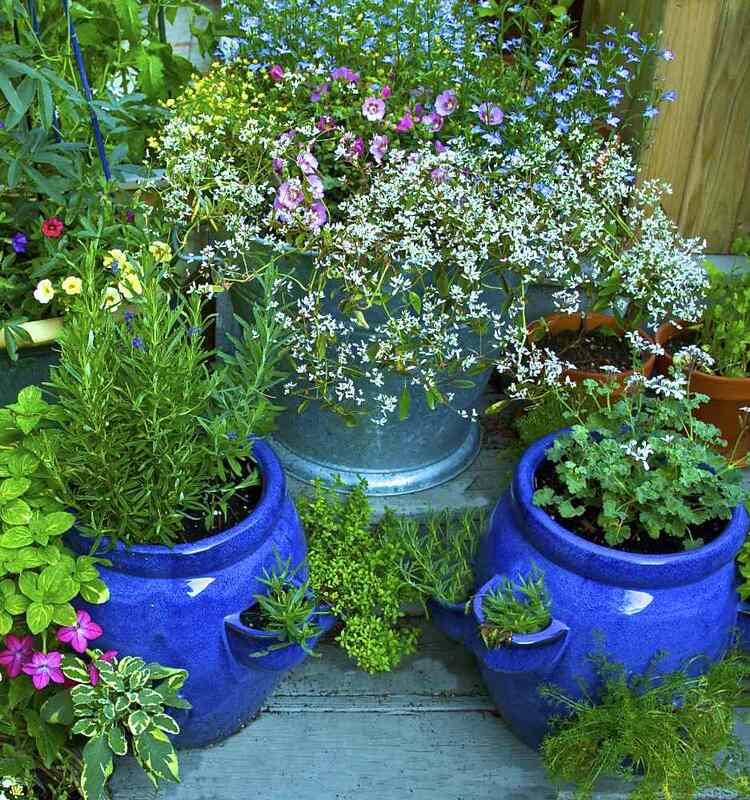 Some herbs thrive in self-watering containers because they like a constant level of moisture. Plants like chives, parsley, marjoram, and mint would be particularly good candidates for growing in self-watering pots. Other herbs, like oregano, thyme, rosemary, and basil, prefer to dry out between watering so wouldn’t be good candidates for self-watering containers. Help your herbs thrive with the right soil, sun, and feeding. Use high-quality potting soil because most herbs need good drainage. Also, make sure that your container has drainage holes so you don’t drown your herbs. 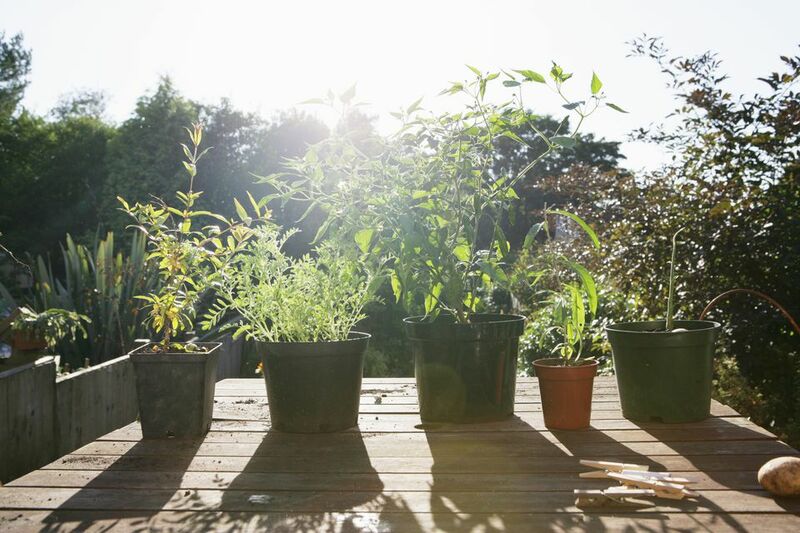 Most herbs need full sun for at least six hours a day. That said, containers can really bake on a hot day, so if you live somewhere where temperatures soar, your herb containers may need to be shaded during the hottest part of the day. Be careful not to over-fertilize your herbs. Most don’t like it and some herbs will simply die if they are fussed with and overfed. Some herbs, like thyme and oregano, thrive on neglect and won’t be as tasty if they are given too much attention, water, or food. The rule of thumb for harvesting herbs is that the more you pick, the more you’ll get. Also, you want to pinch back most herbs to make them bushier and well-formed. But always tailor your harvesting to the plant. For example, basil leaves should be harvested regularly, and flower buds should be removed, but the plants should not be cut all the way back. At the end of the season, if you have lots of indoor sun, you can bring many of your herbs indoors. All herbs are worth a try, though some are easier than others to keep alive inside through the winter. Another way to use herbs in containers is to give them as gifts. You can do themed herb container gardens, like a "pizza" garden or an herbes de Provence container garden. Combine herbs and edible plants in a pretty basket, or just pick a handful of herbs and put them in a nice vase for an herbal bouquet.